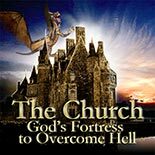 THE CHURCH: GOD'S FORTRESS to Overcome Hell! The Church is God's Ark, an Oasis in a very fallen and dangerous world. We must together be loyal and submitted to one another inside His City on a daily basis, from the heart. That's the ONLY thing the gates of hell will not prevail against. This is such a serious life and death issue because the dragon of the world is real and hell is real and a WAR is raging. The Church is in the world but not of it and His people must see the world for what it is. God desires walls of protection around His people, and we need to have the passion of Nehemiah to build the walls. The book of Nehemiah tells of his building the wall around Jerusalem, and the Holy Spirit building the wall around the Church. The Gates; We NEED Them! Life and Death to an EXTREME! !